We are so very excited to share a new tutorial by a very talented crafter Ms. Vidhu Thareja this month who is showing how to do decoupage on ceramic tiles. She has shared 4 projects using different techniques in each of them. 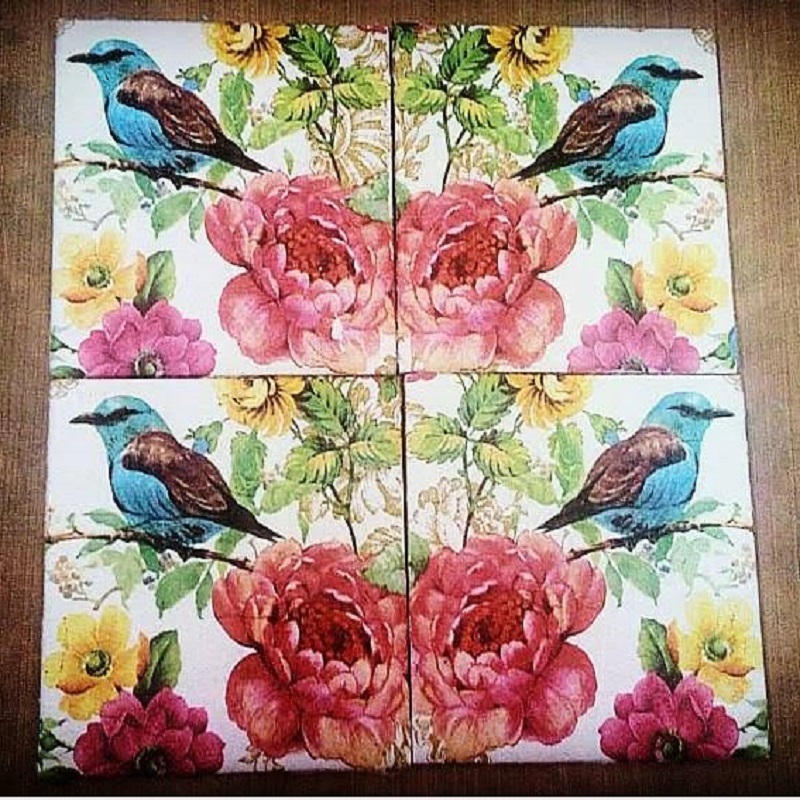 With so many creative options a ceramic tile can be altered into a unique home décor piece. Hello everyone. Vidhu Thareja here to share very exciting projects with my crafter friends. 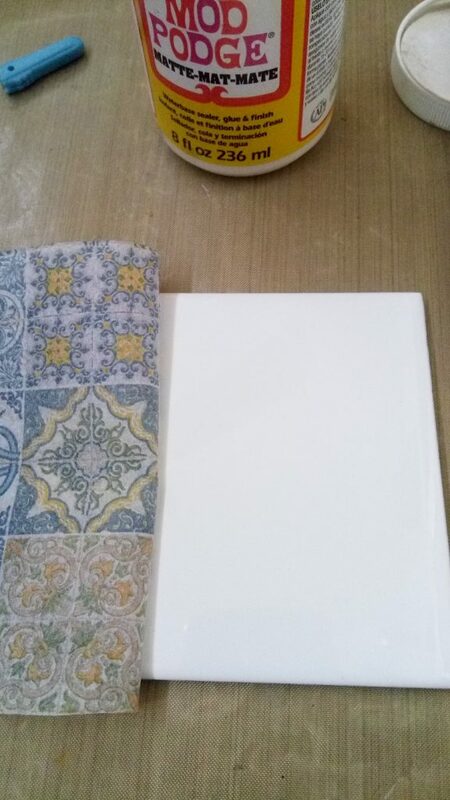 All of you must have done decoupage on glass, metal but have you ever thought of doing decoupage on ceramic tiles? 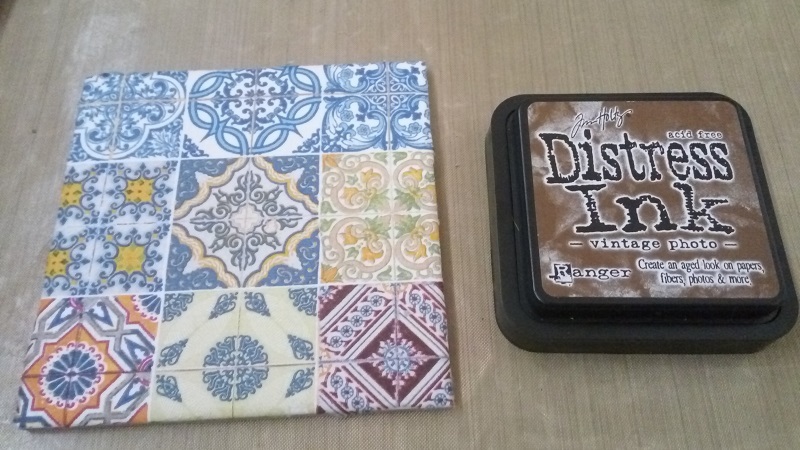 Yes, decoupage can be done on ceramic tiles also. This product is very popular in western countries but this product is very much new in Indian market and introduced by our favourite store Connect4Sale. 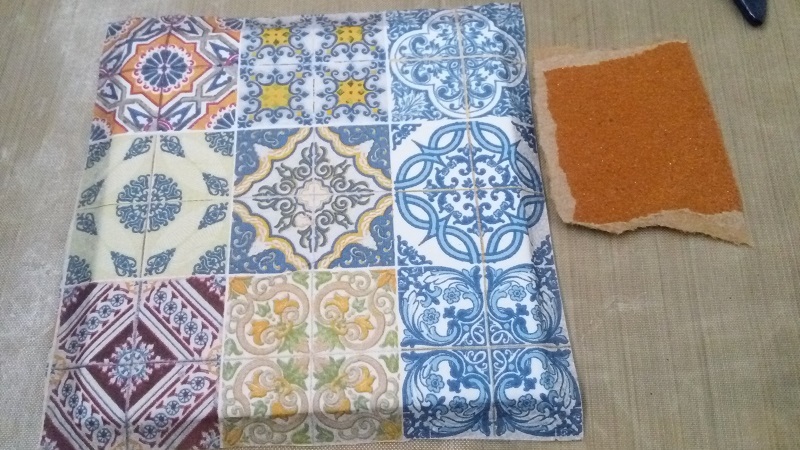 I was very excited to see these tiles, when Deepa Anandakrishnan sent me these tiles to work upon. 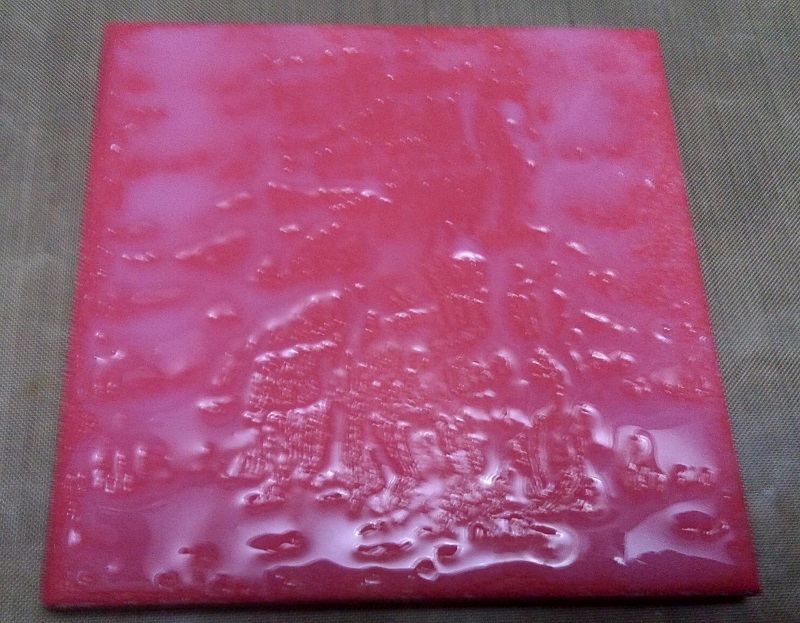 These tiles come in the size of 4 x 4 inches, which is very much suitable for many projects like coasters, fridge magnets, wall décor tiles and so much more. 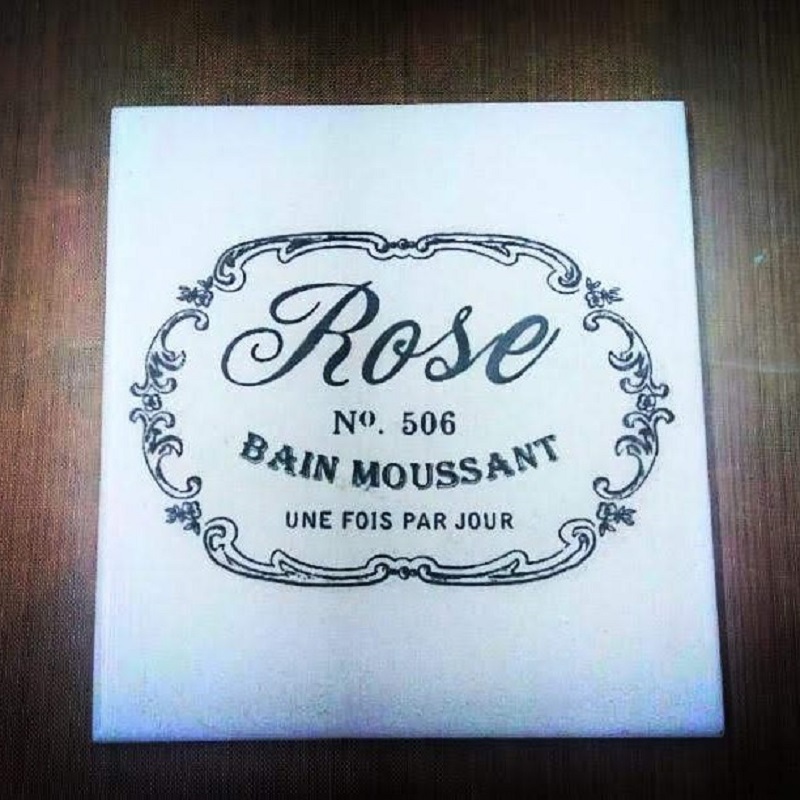 Apart from decoupage mixed media, ceramic work, clay work, glass painting, image transfer can be done on these tiles, so possibilities are endless. I am sharing few of my creations with a step by step tutorial. 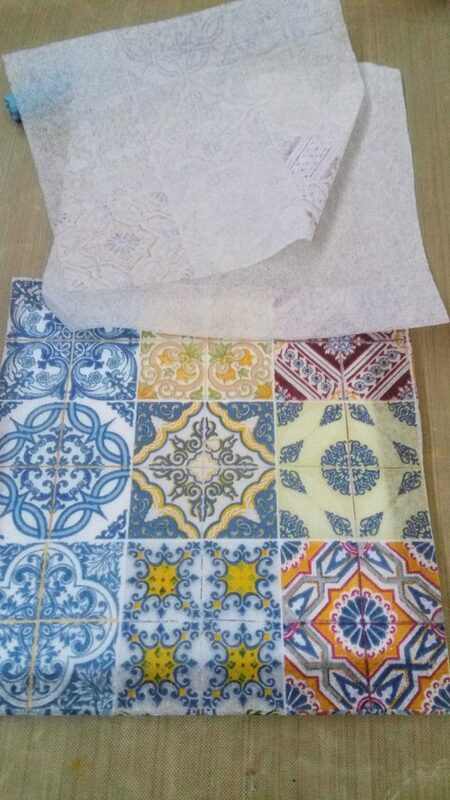 I would like to mention here that it is very important to clean tiles with spirit or alcohol to make it dust free or finger impression free, as we all are aware that for decoupage we need a clean surface. 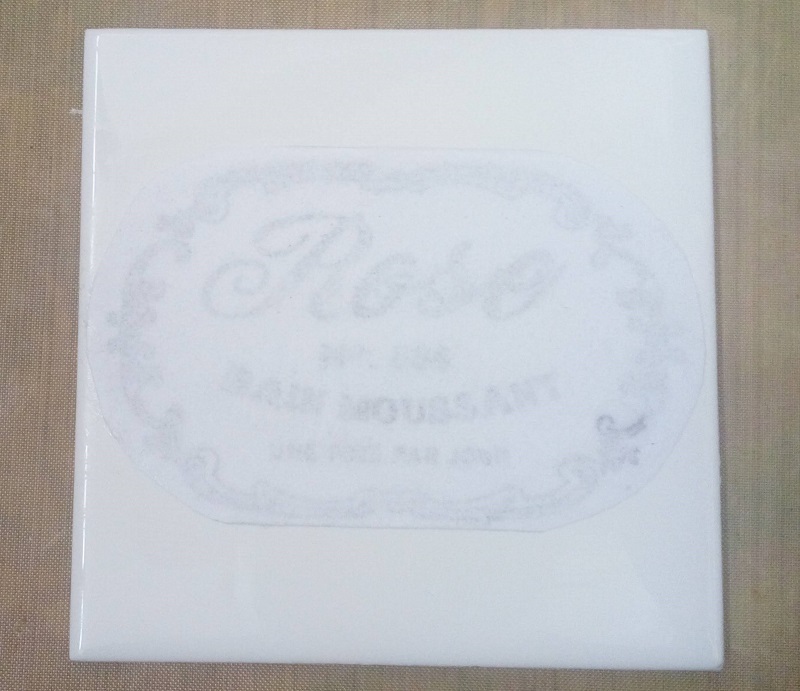 As the tiles comes in white color, we don’t need to apply gesso or any primer on base. 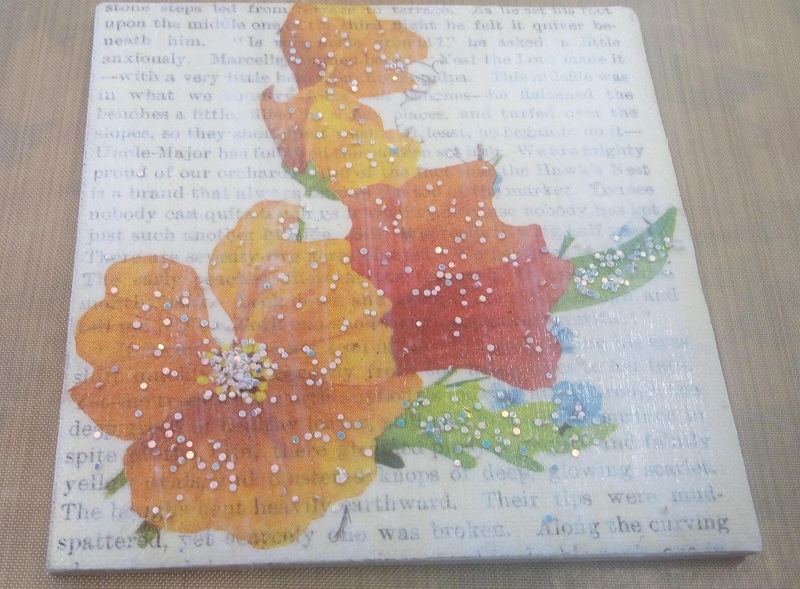 On the first tile, I have used a beautiful tissue from Connect4Sale for decoupage. 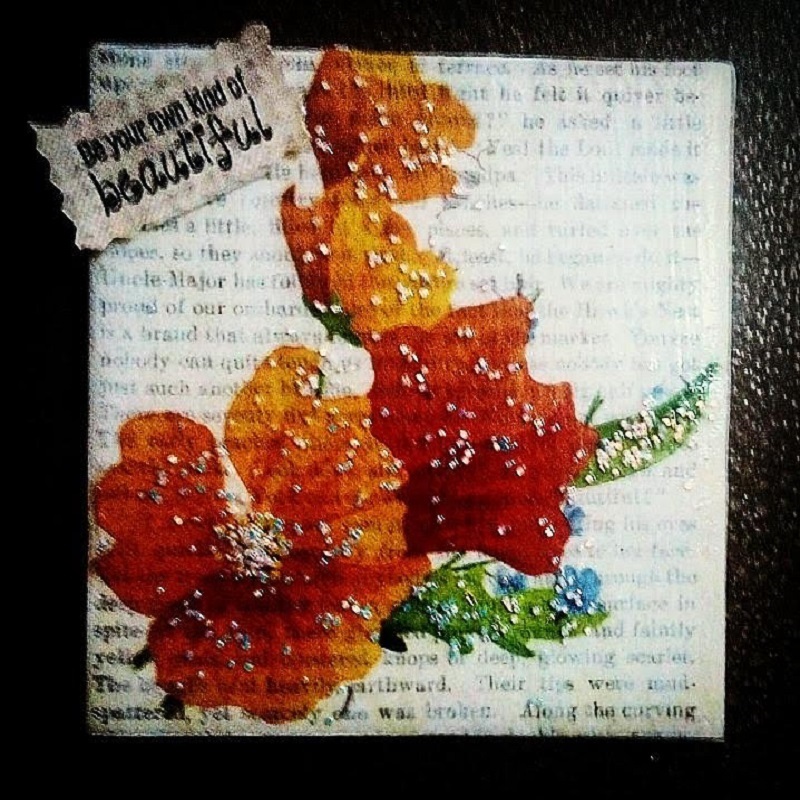 I have used Mod Podge Matte to adhere the tissue. Remove top layer of tissue and place it on tile. You can cut tissue according to the size of tile and if you see any extra tissue on sides, sand it. Since the surface is little slippery, do not paste the whole tissue in one go. First place the tissue, hold it with your hand. 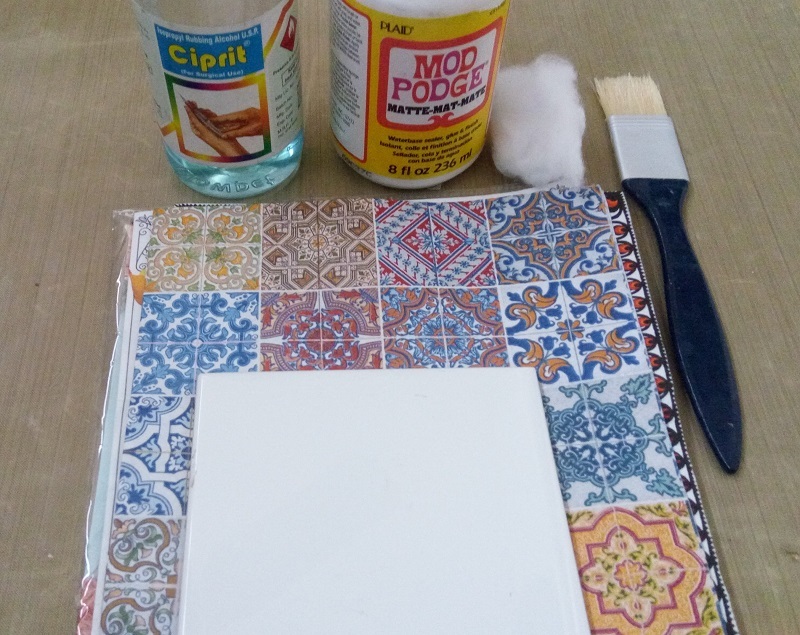 Apply Mod Podge on a one portion and adhere the tissue and then cover the whole tile step by step. Place a plastic sheet or cling sheet to remove air bubble from inward to outward direction. Use cling or plastic sheet to adhere the tissue to the tile and to avoid air bubbles. If you want you can distress the sides, using Distress Ink and in that case leave it for few hours. 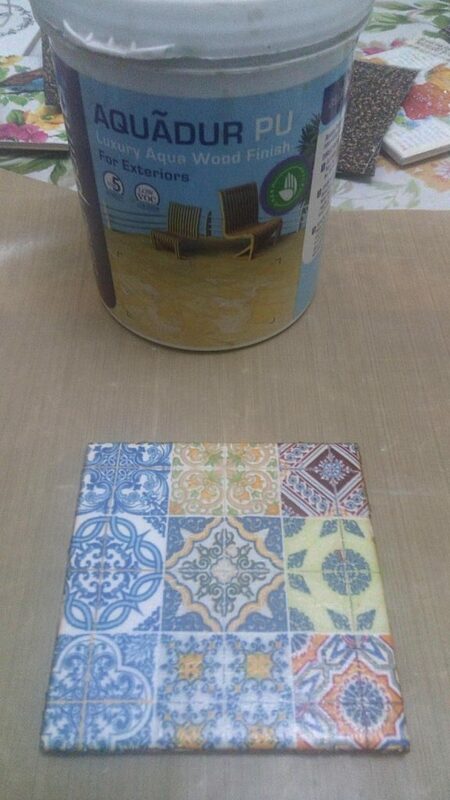 Then seal the tile with Mod Podge and again leave it to dry. Final step is to seal the project with Aquadur Pu varnish from Asian Paints. Apply multiple coats of varnish to make the coaster long lasting. 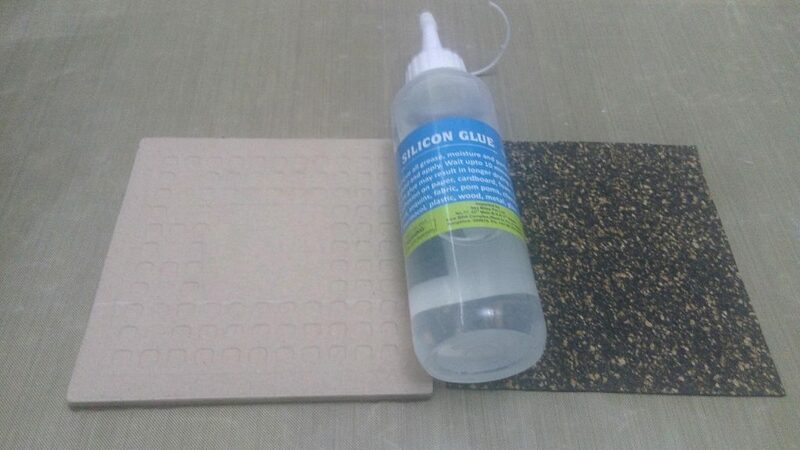 On the back of the tile I have pasted cork sheet with the help of silicon glue. You can use hot glue gun or any strong glue. 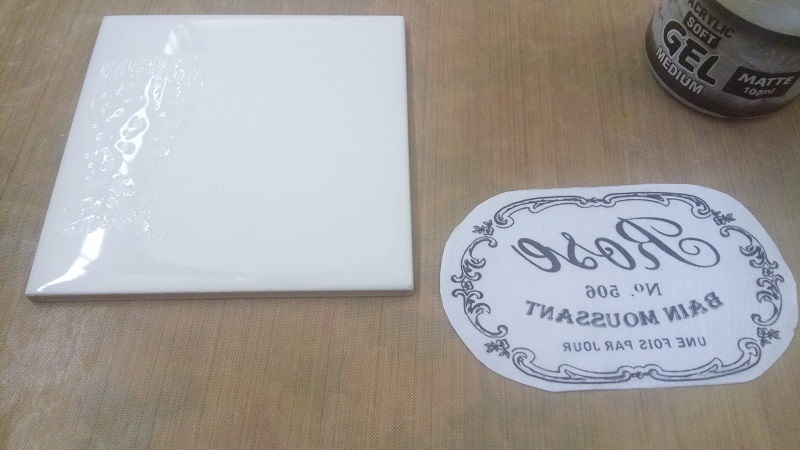 While making first tile, a thought came to my mind that tile can be used to create fridge magnet also. Now I have used a different technique. 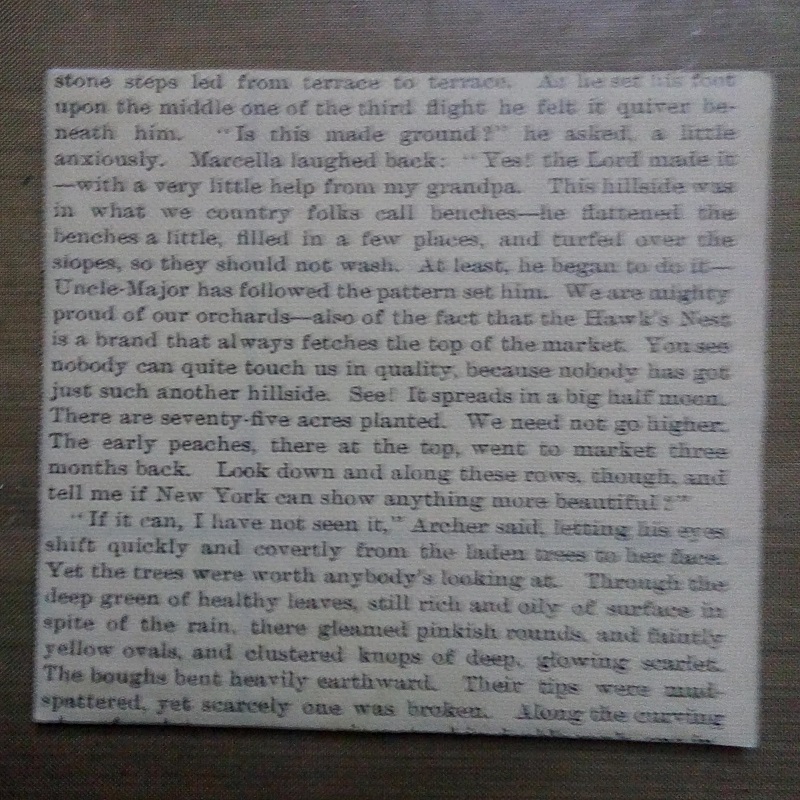 First I have pasted a decoupage paper, which has writing on it. Then I have done dry brushing of gesso to tone down the writing, since I want to add napkin on top of that. I took out a pattern of flower from the tissue, using wet brush technique. This tissue is from Connect4Sale. I adhered that pattern on printed paper, using Mod Podge Matte. Add a caption of your choice. 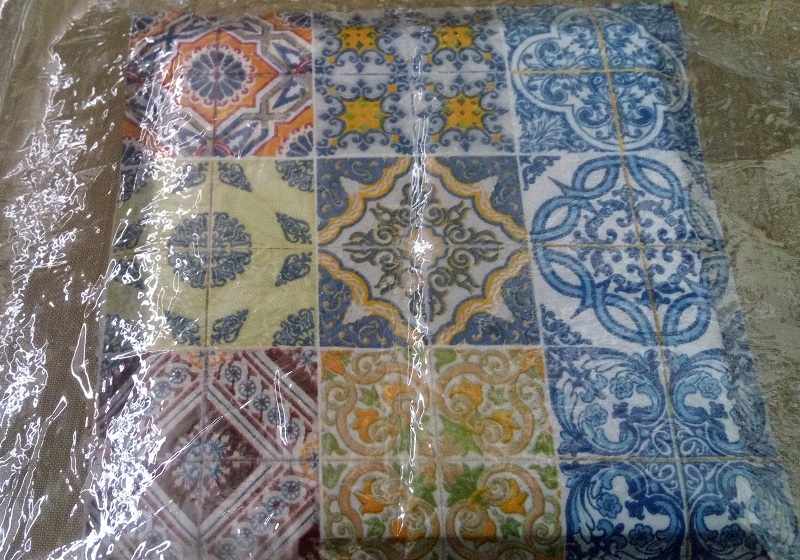 This beautiful tile is ready to gift. On the third tile I have used crackle technique and for that I have used DecoArt 1 Step Crackle Medium, which I bought from Connect4Sale. 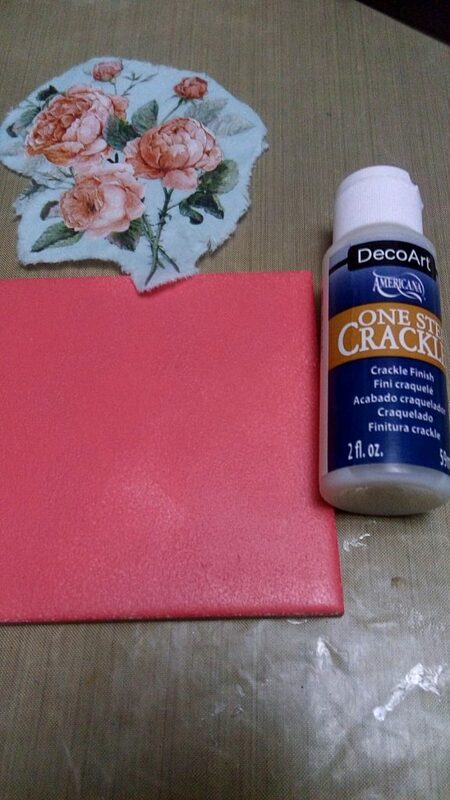 On this tile first I have applied a coat of Gesso with the help of sponge dauber. After that I have applied one coat of chalk paint. I left it to dry. Then I took synthetic brush to apply one step crackle medium in zig zag direction. On this I did not want big cracks so I have applied a thin coat of crackle medium. I left it to dry naturally. 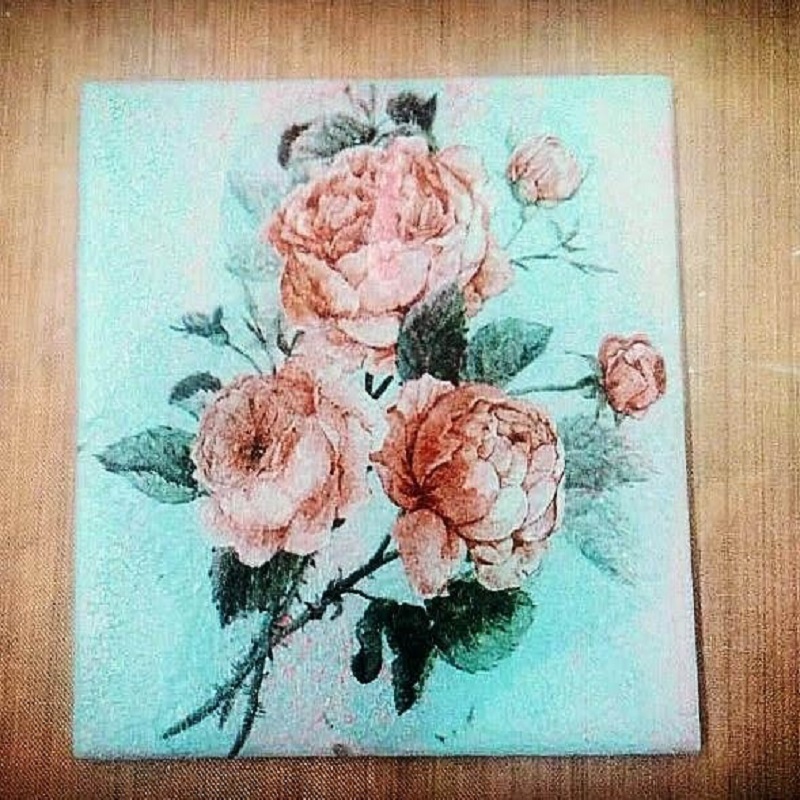 For this tile also I took out a flower from the tissue, using wet brush technique. When crackle medium got dried, I have used contrasting color of chalk paint. When chalk paint starts drying, you will see cracks getting visible. I adhered the tissue on top of that. Then I repeated the steps of sealing the project with Mod Podge and varnish and then finally pasted the cork sheet on the back of the tile. Image transfer technique is getting popular these days so I wanted to try that on tile also. 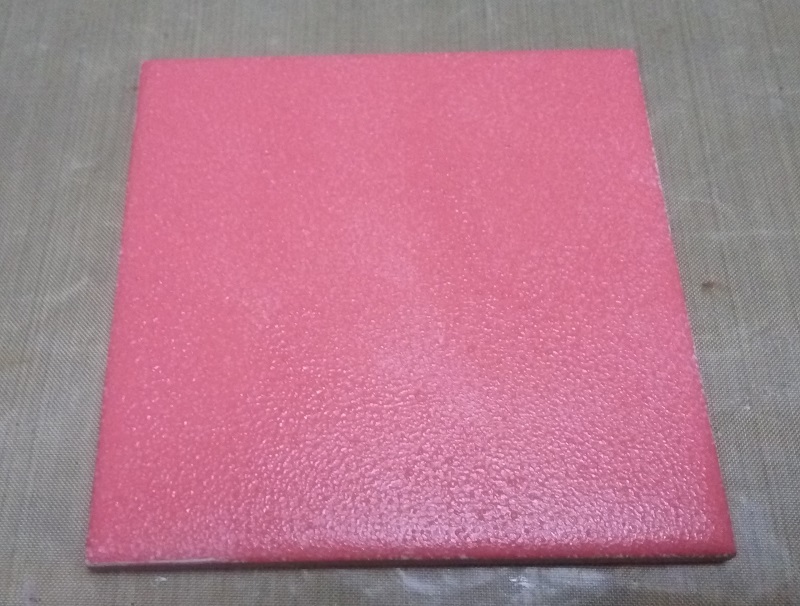 For image transfer, I have used Stamperia Image transfer sheet, available at Connect4Sale. These sheets comes in set of two sheets and has very beautiful designs. You can choose as per your requirement. I have chosen one pattern from the sheet and done fussy cutting. Then I took Soft gel medium to adhere the image, face down. I pressed the image from all sides, ensuring there will be no air bubble left under the image. I have used plastic sheet to smoothen the image. You can use any old debit or credit card to remove air bubble but be careful while doing it because this paper is not very thick. I would like to mention here that I have applied soft gel medium on tile and image also. I kept it to dry for 12 hours. It is very important to keep it to dry for sufficient time. Now it is turn to remove the layers from the image. Wet your fingers and gently rub the paper. Slowly rub the paper and remove the layers from the image, until the final image gets visible. When you see that final image is very much clear, clean it with soft cloth and seal the image with soft gel medium itself. 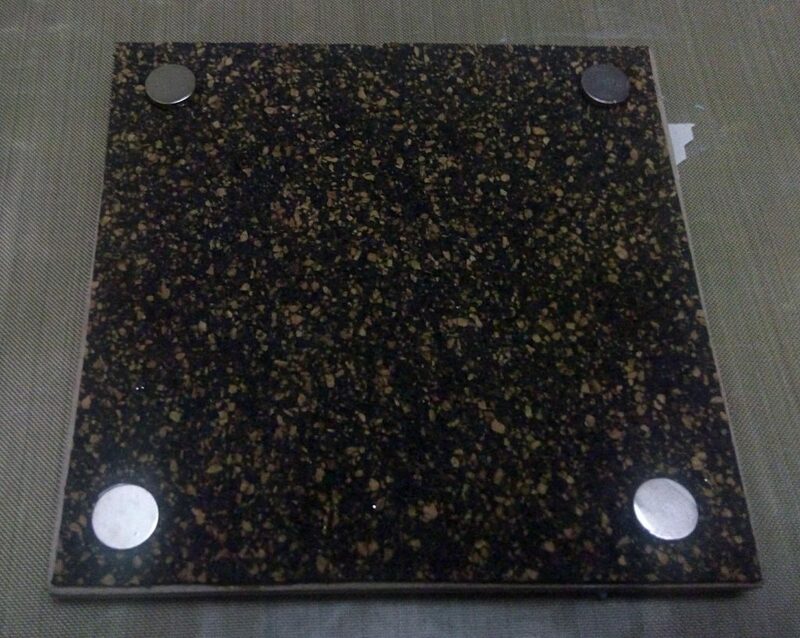 On the back side of this tile also, I have pasted cork sheet.. Your project is ready to you. 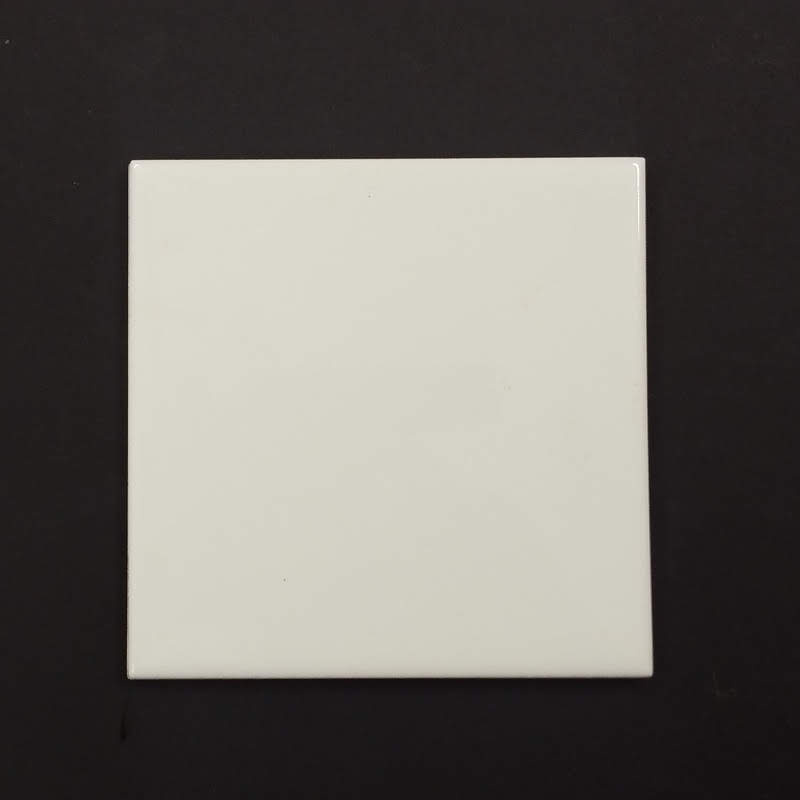 For the last project, I have used one single tissue on four tiles. 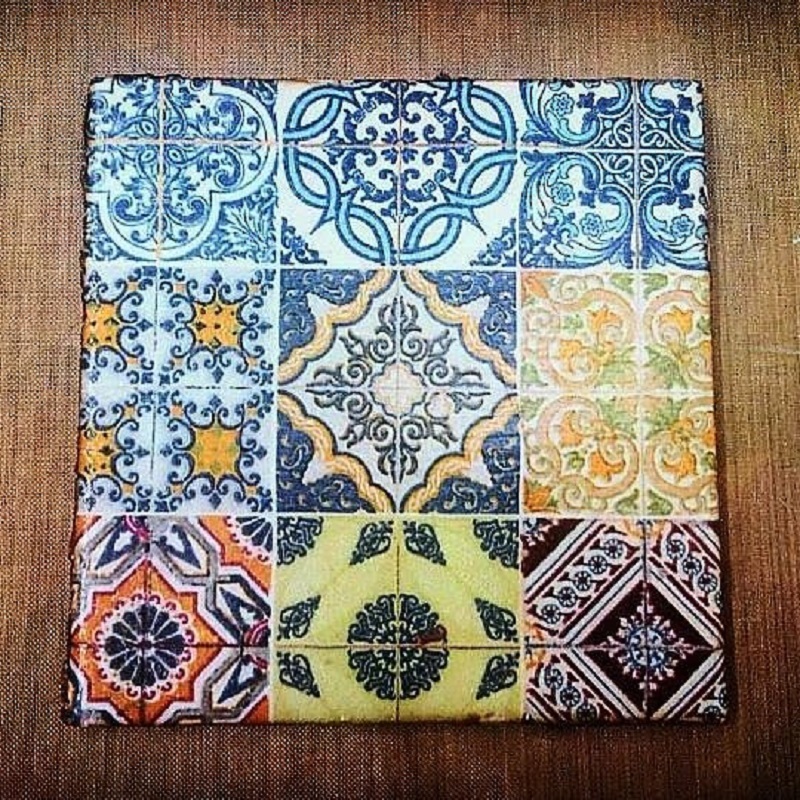 These tiles can be used as coaster set or wall décor or center piece on dining table/ centre table. Vidhu Thareja is a crafter from Noida, born and brought up in Delh. She had completed her studies from Delhi. She began her career as a freelance translator and worked with many reputed publications. She has also worked in the Insurance Sector for many years. Due to personal reasons she had to give up her job, which actually turned out to be a blessing in disguise. The turning poing came when she got the golden opportunity to work with Madura Coats Pvt. Ltd. as a Craft Consultant for their Anchor Thread Craft activities in reputed schools of Delhi/ NCR Region. Although it was not a very high paying job it gave her all the confidence and a feeling of fulfillment, which made her realize the crafter hidden in her. Since her childhood she was very much interested in crafts. Growing up, there was not that much exposure to tv or computer and she used to do embroidery in her free time or during vacations. Her biggest inspiration was her mother who is her motivating force. At the time of conducting Anchor thread craft workshops, she started doing DIY activities and decided to learn more. From then there was no looking back and today she is doing what she loves to do. Although every new technique and art form attracts her but Decoupage and Sospeso are the two crafts, that she enjoys the most. She never lost a chance to learn anything new because she believes that learning never stops. She follows her fellow crafters because she feels every person teaches you something. To all upcoming crafters she has this to say “That whatever you do, do it with love and passion, follow others but make your own style statement. Be confident but never be over-confident. Share your knowledge, that is what makes you grow”. All projects are amazing. Thank you so much for sharing loads of information with us. Wonderful projects and loads of knowledge for all of us. Thanks Vidhu ji .